This wheat weave necklace with simulated diamonds, valued over $500, is a gorgeous holiday surprise for that special someone in your life…or just for you! Good Luck! This giveaway is now closed. Thank you to everyone who participated. We wish you a wonderful holiday season! Congratulations to our winner Megan B.
Ho Ho Ho! Holiday giveaways are a go! We are honored to be working with the terrific folks of Wayne’s Farnan Jewelers this holiday season. Farnan is celebrating their 100th anniversary as the Main Line’s renowned family-owned and operated jeweler in the heart of downtown Wayne. Their reputation for terrific customer service is unparalleled. “Our clients appreciate the fire, glow, and personal connection to the art of jewelry. The sentimentality of giving and receiving a precious jewelry piece is an unmatched experience. That moment when the gift is opened, the gasp of delight, and the smile of contentment warms the heart like no other gift,” enthused third-generation owner Claire Farnan. They recently completed a terrific expansion—doubling their showroom space. To celebrate this exciting milestone in the Farnan tradition, we are giving away a gorgeous piece of European fine jewelry. Win a Charles Garnier ‘Ravello’ sterling silver wheat weave necklace with simulated diamonds. 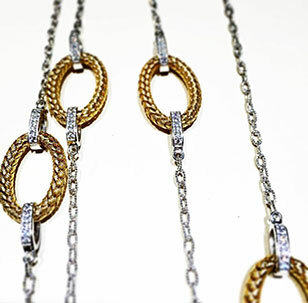 The diamond cut 36” long cable chain features links with a 14k yellow gold overlay finish. This stunning piece is valued at $575. Comment below by 9pm on Monday, December 21th, 2015. One lucky winner will be chosen by random.org. The winner must pick up the necklace at Farnan Jewelers and show I.D. with a secret code you will be provided. This is gorgeous! I would love to win this beautiful necklace. Oooo pick me pick me!! I would love to win this and give my mom a wonderful Christmas present this year!Thanks for the opportunity! This is pretty little nugget. My girlfriend would love this!!! Spectacular!! I have been going to Farnan for years and love them! Best jeweler around! My wife would look very nice with this necklace on. I enjoyed trying on jewelry at Farnan Jewelers! The necklace is more beautiful in person! I love Farnan, they’ve done great repair work for me. Would love to win! Very elegant and quite stunning! A necklace worthy of wearing every day! Excellent gesture and let’s match value to ASPCA! So versatile! Thanks for introducing me to another great local business. Would love to win this elegant necklace. Charles Garnier jewelry is gorgeous. Beautiful necklace! Wow! That is stunning. I would love to win this necklace. I think I would need to wear it everyday. It is a really elegant design! Brilliant idea for a shining gift one is sure to treasure. Absolutely stunning! The length and mix of silver and gold is exactly what sets it apart from other pieces! I love the two tone settings! I would wear it with pride and tell everyone where it came from! Thanks Farnan, you’re the best! This necklace is so beautiful. I would love to win this. Thank you. Lovely necklace and great contest. What a gorgeous necklace! And thanks so much for offering this giveaway! You’re going to make someone’s holidays very happy and bright!!! Beautiful necklace! Congratulations on 100 years! This is a fabulous idea to drive support to community businesses like Farnan Jewelers…AND a stunning necklace for the holidays? Definitely a win win!!! This is something my wife would love! Lovely! It would be a merry Christmas indeed! This is a gorgeous necklace. Amazing style. This would make a great Christmas present for my wife! !